Pioneer Human Services runs a number of programs in Spokane: Re-entry programs with transitional housing. The Carlyle Care Center. But one thing they don't have in Spokane: immigrant children separated from their families. "We don’t have any youth programs in Spokane," says Harold Wright, director of Youth and Young Adult Services for Pioneer Human Services. That's despite a USA Today graphic published last week that set local activists abuzz. 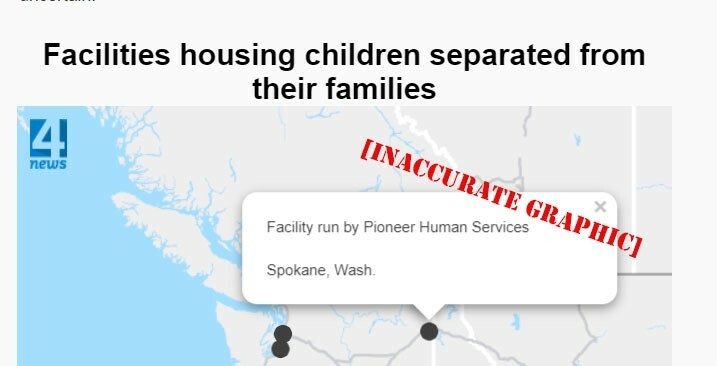 A map compiled from "federal contracting records, local news reports and the limited information being released by federal agencies" purported to show that Spokane was one of the communities housing children who'd been separated from their immigrant parents by the the Trump administration's "zero tolerance policy." With little to go on other than that it was a "facility run by Pioneer Human Services," activists tried to gather as much information as they could. One possible reason there may have been confusion on USA Today's part? Pioneer Human Services does have a 23-bed facility for unaccompanied immigrant minors at Selma Carson Home, in Fife, Washington, in the Tacoma suburbs. Wright says they've been operating the facility since about 2003. "We have unaccompanied youth who are about 16 years old," Wright says. But at Selma Carson Home, Wright says, the goal is to try to reunite unaccompanied minors with their families, or at least find them stable, supportive foster families. "We're trying to reunify them with their families or a healthy adult," Wright says. "We’re trying to provide support around mental health. Substance abuse. Jobs skills. English." A recent Tacoma News Tribune article quoted a Seattle-based attorney who claimed that at least one immigrant child separated from their parents had been sent to Selma Carson, but Pioneer Human Services said that was inaccurate. They have kids that crossed the border on their own, but not separated from their parents because of the Trump policy. "We checked all of the files of our clients and with confidence I can say that up to this point we have not served any youth who have been separated from their parents at the border in the U.S.," Art Tel, Selma Carson's director of programming, told the News Tribune. "Clearly all of the youth we serve are separated from their families in their country of origin by choice, force or out of desperation. Also, their detainment in the U.S. is a separation — but the youth we serve have not been taken from their parents here." This weekend, some local activists suspected that the facility in Spokane referred to by USA Today was Martin Hall Juvenile Facility, a detention center in Medical Lake. Some even drove out to the area to try to see if Martin Hall — or the nearby shuttered Pine Lodge Correctional Facility — was a location undocumented children were being held. But that's not the case with either facility. The former Pine Lodge site is owned by the Department of Social and Human Services. It's the site for Consolidated Support Services, a DSHS office that provides maintenance support for a variety of local DSHS sites. "No undocumented children are housed there," DSHS spokeswoman Mindy Chambers says. Meanwhile, Robert Palmquist, a juvenile detention facility administrator at Martin Hall, shoots down the idea that Martin Hall holds any separated immigrant children. Nine local counties currently contract with Martin Hall for juvenile detention services. It isn't operated by Pioneer Human Services — it's operated by a nonprofit corporation called Community, Counseling and Correctional Services based in Butte, Montana. Palmquist says Martin Hall used to take in unaccompanied immigrant minors under a contract with the United States Immigration and Naturalization Service. But that contract ended, and he says Martin Hall has “not been in that business” since before the Obama administration. USA Today did not immediately reply to an email from the Inlander asking why the publication had claimed a Spokane facility operated by Pioneer Health Services was housing children separated from their families.